Rushing to fit lone wolf attacks into prevailing narratives is a mistake. At 2.10 am Tuesday morning a police tactical response team charged the Sydney café at the center of a hostage crisis that had begun on Monday morning. 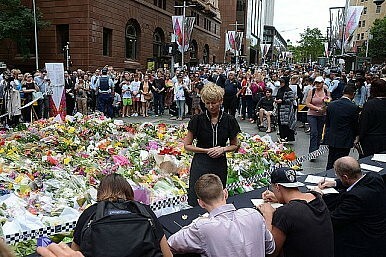 The gunman, Man Haron Monis, had begun shooting. Two hostages were killed and three hospitalized with gunshot wounds. Monis was shot dead by police. After a 16-hour ordeal that had grabbed global media attention, Sydney’s hostage siege was over. Its impact will continue to resonate for some time yet. While details continue to emerge, here’s a look at what went right. The Australian government had a moment of clarity and, in the midst of the hostage crisis, somehow managed to downplay the siege. In a press conference a few hours after the siege began, Prime Minister Tony Abbott was small on details, instead allowing authorities to lead the flow of information to press. What he did stress was important: “We don’t know if it is politically motivated.” In relation to the threat of copycats he would later say that “There was nothing consistent about this individual [Monis] except that he was consistently weird, I don’t think anyone would want to emulate that.” His response starved the incident of its attention-seeking intent. Next to the government’s response, the media coverage was, at least on the crucial operation points, excellent. Despite attempts by Monis to get his message out via media, his communication was muted. He took to YouTube instead, uploading messages spoken by hostages; law enforcement followed by deleting the videos within 30 minutes. When he called 2GB, a popular radio show, he wasn’t put to air. Again the media showed restraint. The importance of this was explained by terrorism expert Adam Dolnik: “From a negotiating perspective, when people commit to something very publicly they have a much greater internal need to be consistent with what they’ve said.” This public commitment then makes negotiation much more difficult by increasing the need for face-saving mechanisms in the negotiating process. Similarly, media (by and large) avoided airing live video feed of the café, which may have allowed Monis to monitor the police operation. Live coverage of the Mumbai siege in 2008 supported the attackers in their situational awareness, as they tracked operation movements and developments through Twitter (a further study on this here). However, despite operationally good media coverage, there were chinks in the professionalism. The presence of a Shahada flag, wrongly reported as the ISIS flag, meant this was labeled an ISIS terror attack. A quick fact check would have queried such assertions, but the temptation obviously proved too great. Worse still, was the Murdoch newspaper the Daily Telegraph, which ran a special afternoon edition, its front-page reading: “Islamic State takes 13 hostages in city café siege.” It was a wild claim that speculated both on the number of hostages and the culprit. From here, and from the few bad apples, the rot began to spread – increasing as the siege dragged on. By afternoon, as live media coverage continued with few new facts, the narrative firmed that this was an ISIS-led hostage taking. Invited experts opined that this was likely the beginning of a new era of lone wolf attacks, a threat the intelligence community has long and worryingly anticipated. Others noted that it marked the realization of the ISIS fatwa issued in September calling for such attacks. Indeed, lone wolf attacks are the threat the intelligence community has long feared – low-capability, high-impact attacks much like that seen in Woolwich, London, in May last year. But the Sydney siege does not appear to be cut from the same stone. The attraction for ISIS recruits lies in the chance of a zero-to-hero, redemptive narrative. A narrative that brags that one “brave” act can redeem a bad or immoral life. The attraction of this redemptive narrative is emboldened by the prospect of international media attention, a fifteen-minutes-of-fame. Monis appears to fit the ISIS bill only in the fact that he was disgruntled and desperate for his fifteen minutes. He had battled numerous cases in court, had picketed on his constitutional rights, and was known to police as a public menace. In the immediate lead up to the siege Monis was angry following an unfavorable ruling in a case he brought to the High Court (explained here). By the account of his lawyer, he was consumed by this case. The charge of accessory to murder, from which he was on bail, may have also seen him serve jail time. This all took its toll, the man himself appears motivated by desperation and discontent rather than religion. His alleged support for ISIS (if it came at all) was incidental and opportunistic. From these types of attacks our societies can be pushed two ways: toward a police state or toward greater resilience. Despite a raft of new anti-terror laws that were passed in Australia in the wake of new terror threats this year, they were not (and could not) have been employed to arrest Monis. Indeed, lone wolf attacks are near impossible to prevent through legislative means. Such random acts of violence are but one individual playing out their grievances for an ostensibly political ends, but primarily driven by the need for personal gratification of some sort. Searching for larger motivations and narratives of violence, as the media did by attributing this to ISIS, in order to understand troubling situations, is human. Yet it is a base instinct unbecoming of intelligent societies. In doing so, it abdicates our responsibility to look for profound answers to why people, citizens, commit such criminal acts. Ultimately, this clouds an intelligent and preventative policy response further down the track. The prime minister is raring to go, despite the questionable wisdom of the move.